THE BOOK | Welcome to Virgin Territory! Newly transplanted to a beach in Mexico, a move made on the spur of the moment, author Susan J. Cobb begins redefining herself, or rather discovering her unrealized potential. 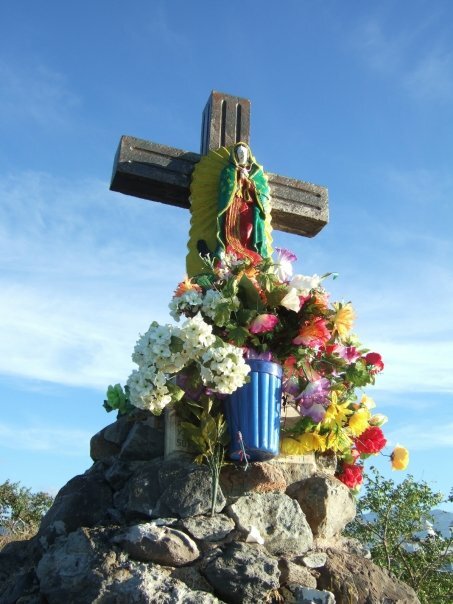 From her kitchen window she can see a colorful concrete statue of the Virgin of Guadalupe installed at the end of a jetty. Above the waves, covered with plastic flowers and seagull poop, the quiet stability of the Virgin statue becomes a metaphor for the author. “Mary said ‘yes,'” she remembers. She didn’t say, “Wait a minute, I need to talk this over with Joseph. What are Mom and Dad going to say?” She said ‘yes,’ and moved into a whole new experience and identity. Saying, “yes,” is like that. It can change the world. 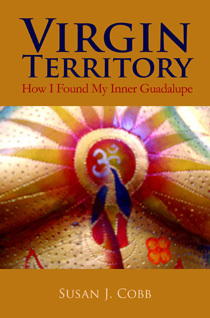 Get your own copy of Virgin Territory: How I Found My Inner Guadalupe through this website, through Amazon, or download it on your Kindle. If you’ve ever been an Amazon customer, I would be SO grateful if you’d write a review. Even if Virgin Territory isn’t top of your list, every review adds to the conversation. And you don’t have to BUY the book from Amazon in order to write a review of it. If you are in Mexico buy your own copy at these bookstores and specialty shops.